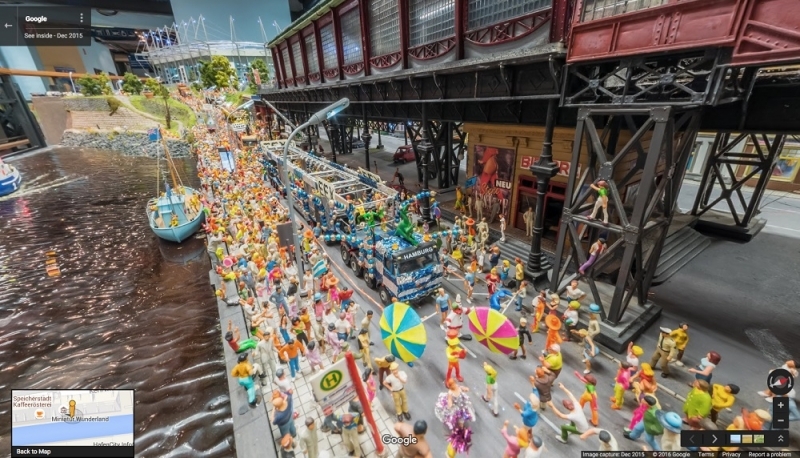 Every year, more than a million people flock to Hamburg, Germany, to visit the largest model railway exhibit in the world – the Miniatur Wunderland. Now, with help from Google, you can see this tiny world from the comfort of your own home. And not from the perspective of the tourists, but actually inside the Wunderland, thanks to Google Street View. Street View cameras have taken photographs across the world. But in order to capture the tiny details of the exhibit, Google worked with Unilabs to create miniaturized versions of the devices that were attached to the model cars, trains, and even the boats. Wunderland features areas modeled on countries such as Germany, Switzerland, Scandanavia and the US, including intricately detailed versions of Las Vegas and Mount Rushmore. There are also Norwegian fjords, a working airport, and a massive, open-air concert feature DJ Bobo (he’s very big in Germany, apparently). For the Street View project, Unilabs said it took about two months of experiments and testing before inserting the cameras into Wunderland. The photography itself took about 600 hours. If you want to learn more about the Miniatur Wunderland, then check out the gloriously European video below.